Can you believe it’s Friday again? Where did that week go? Oh well, here’s some randomness from the past few days. 1.) There are certain shrubs/flowers that always remind me of my mom. Of course, there are hydrangea (high geraniums to her), gladioli (which I’m pretty sure she called gladiolias), and irises. And I have all of those in my yard. 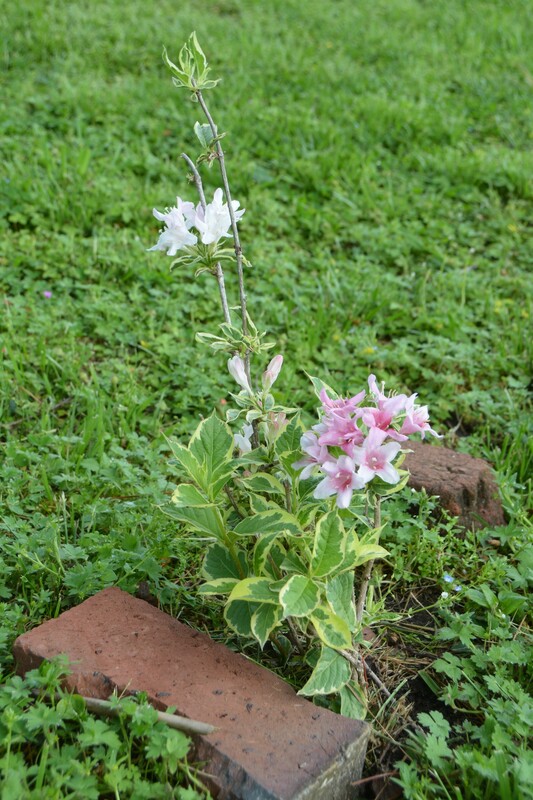 But there are others that remind me of her even more, and I think it’s because I DON’T have those: snowball bushes, bridal wreath, and until recently: weigela. Last summer, I bought a tiny weigela shrub twig on sale at Lowe’s for no more than a couple of dollars. I was so excited to notice yesterday that it’s blooming. 2.) Speaking of flowers, I think I’m finally in the mood to begin the visits to the nurseries/greenhouses. Last summer, I took photos of some of my favorite containers, so I have an idea of what I’d like to buy. I’ll definitely be trying this combo again. 3.) Yesterday morning, Bride Swan was back for a visit, and this time, Groom was with her. One day, I WILL get a shot of their necks forming a heart shape. They stayed all day and were here for the sunset. 4.) Have you been missing Sundae here on These Days? She’s doing just fine. 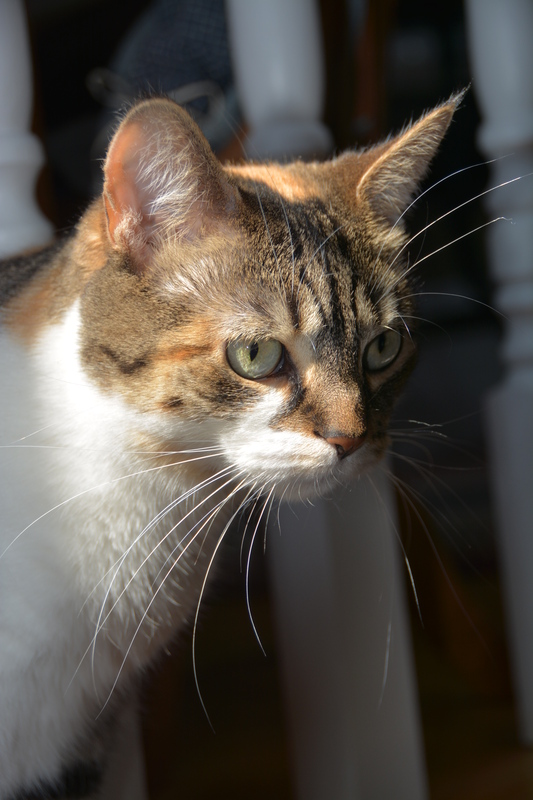 I caught her, recently, enjoying a morning sun puddle. 5.) Motor Man and I are looking forward to a weekend adventure of a different sort; details next week! 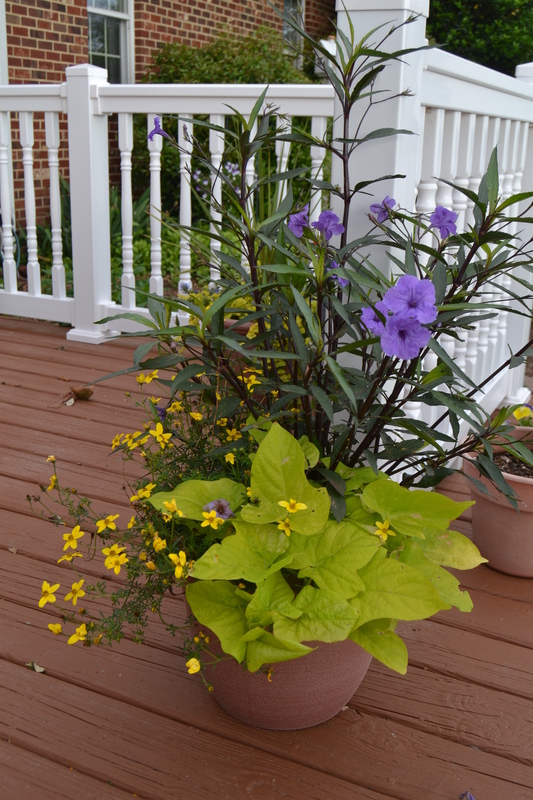 This entry was posted in Days at Home, Family, Sundae, Sunrises/Sunsets, The Swans and tagged black swan, calico cat, mexican petunia, random five friday, sunset, sweet potato vine, weigela, white swan. Bookmark the permalink. So happy to hear the Bride and Groom are still together – AND that they think your back yard is “the” spot for a beautiful sunset…..I do too!! Enjoy your different sort of weekend. Wow, what a treat to see the swans. I love the sunset photo! Enjoy your adventure! My garden is full of memories of friends from all the pass-along plants I have. How nice your weigela is blooming in Mother’s Day month. I like that variegated variety you’ve chosen very much. Hope you have a fun weekend. So nice to see “what’s blooming” and also, to see bride and groom swan together. 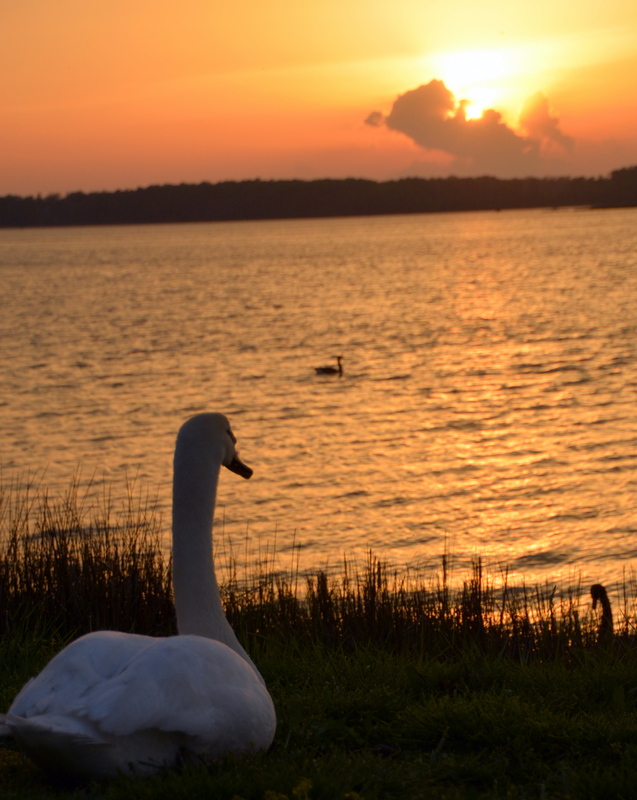 That’s a lovely photo of bride swan sitting towards the sunset. Some day you’ll get that ♥ shaped photo. Have a wonderful weekend. Glad to see bride and groom swan back together. I guess they found a warm,cozy spot to spend the winter. I love your little container…you can’t go wrong with blue and yellow.. 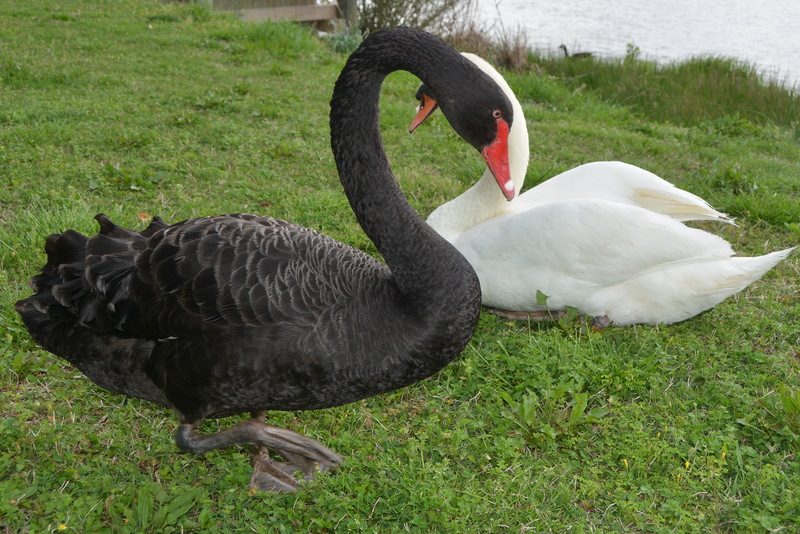 I am HAPPY to see Bride and Groom swan back together at your place! Nice to see Sundae’s sweet fuzz face!! Sunset photo makes me smile, so pretty. Good Morning Dianna! Enjoy your weekend adventure! Forgot to open my mail yesterday and wondered why I felt something was missing. A day without TDoM is like a day without sunshine. Can you close your eyes and sniff the flowers and evoke memories from years ago? Isn’t that amazing? Beautiful photographs – bride and groom, the lovely container flowers! Now that’s the view to end the day with – Beautiful and Restful! Enjoy special adventure – you deserve it! Like I’ve said: they know a great place to enjoy the sunsets ! I’m glad they’re back as a pair ..
& ‘sun puddle’ – good one ! Cute photo of Sundae in her ‘sun puddle.’ It’s nice to see some pretty posies blooming too! What a great gift to see the beautiful flowers blooming after the winter we have had. Love that the swans are together again! Sundae is just enjoying the great spring sun. Looking forward to see and hear about your weekend adventure. Enjoy! Your randoms are so beautiful and calm that I save them for when I need to end the chaos of a day. This was no exception….. the swans and flowers and Serene Sundae in her sun puddle all combine to register peace. Beautiful and enchanting flora and fauna of your home place. I hope you had a good weekend. It’s always neat to hear what you & MM have been up too.